It sounds like something out of the realms of science fiction, doesn't it? Turn on a computer with a thought. Drive a car using brainwaves. Control a prosthetic limb in the same way as you would an ordinary one. As technology advances further and further, we're coming ever closer to unlocking the secrets of the inner workings of the most advanced computer ever made- the human brain. There's something to be said about all this. A few philosophers have compared our current obsession with technology is turning us into figurative cyborgs. When we leave the house without our cell phone, our ipod, our laptop, we feel like a part of us is missing. Inventions like the ones on this list...sort of move the figurative 'cyberization' into literal territory. A picture of the new tech.Used to be prosthetic limbs couldn't really do all that much. Sure, you had something that physically took the place of the old limb, and could kind of do what it used to be capable of...but not fully. Such limbs were usually fairly unwieldy, and above all were a constant reminder that the victim was an amputee. 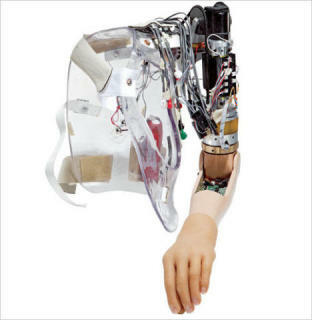 However, recent advances in the field of biomechatronics have allowed scientists to design a fully functional robotic arm. The first recipient, Jesse Sullivan, is unique in that he, unlike most amputees, hadn't lost control over the nerves- most do. Still, the simple news that there's a processor able to link up to the human brain and control a mechanical limb is exciting in itself. Researchers at Northwestern University are currently working to improve the robotic prosthetic and make them more complex. Emotiv's EPOC headset.So...now you can operate a computer with your mind. 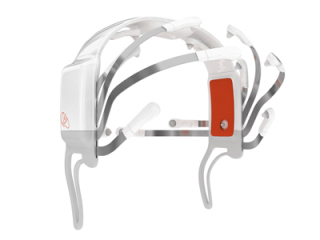 The three hundred dollar Emotiv EPOC allows you to operate a computer solely through thought patterns. 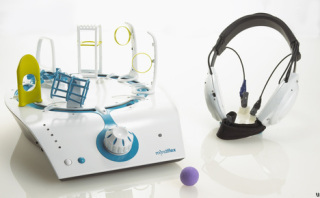 "Marked as both a gaming device and a tool for the disabled, The headset reads brain activity related to facial movements, and uses this to infer your emotional state and intentions. This is then translated in software to control various applications, from games to photo viewers to an on-screen keyboard." (Gadget Lab). It's pretty clear what this could mean for, oh, say....video games, yes? Just so happens that's next on our list. Neurosky's device in actionFull immersion, anyone? This kind of thing has definitely been attempted before, but it didn't quite work out.. However, as our society's level of technology, we're understanding better and betterhow the human mind works and interacts with the physical environment. In so doing, we're developing ways of allowing it to interact with a digital environment. Imagine it- a first person shooter that's based more on mind-power than hand-eye coordination. Still a ways off, but...we're getting there. Sega/Neurosky's already got one piece of tech out that converts brainwaves into computer signals- their "Think-gear" line(which, interestingly enough, isn't just used in video games.) Additionally, they've got another, even more advanced device in production- Project Millennia, unveiled in 2008. The day may well come when controllers are rendered obsolete. To be fair, this one kind of goes hand in hand with the previous entry- it utilizes EEG technology to read brain waves, allowing the user to move and levitate a Styrofoam ball around, giving the illusion of telekinesis. The sensors not only detect the brainwaves, but the intensity of them. This means that the harder you focus on it, the more powerful the fans that move the ball will be. It's not really as complicated as some of the other entries on here, but pretty cool nonetheless. Mindflex goes for around $59.99 online. So there you have it. Pretty cool, no? Lately, it seems as though more and more of the things we once thought were confined to the realm of fiction are becoming reality. That just leaves me with the question of what's going to happen to sci fi when society finally catches up to what the genre's been dreaming about since its inception.